just like training, it’s all about the process. I think (hope) lots of folks know that I have developed a fondness (aka obsession) with making good espresso. As you might expect, it’s the technical nature that really has driven me to become so passionate. I bought the domain engineeringespresso.com, and while I am not yet ready to do something (anything) with it, I thought I might start posting more about the conversations that I have with good friends on this subject. Since I wrote something this morning that could serve double duty as a blog post, I decided to just go ahead and repurpose it. Trevor Wurtele and I were talking about tampers on twitter, which led to a more in depth discussion on email. Trevor asked some good questions. I gave what I hope were at least somewhat informed answers, though I will welcome any corrections, counters, addendums, etc. I’m by no means an expert; just someone who is working hard to become better. Naked porta filter? Why do you use that and will you stick with it? I admit that it looks pretty cool when you pull a nice shot. Is it more of a tool to use so you can see that you’ve made a good shot, or something else to it? I’m guessing using a scale pre, during, and post brew has been pretty important? Is that something you do all the time, or was it just to get perfect dose/brew time dialed in? Does it change a lot from day to day or bean to bean? What kind of gram measurement numbers are you looking at that give you your best shots? I use a scale every step of the way for every shot. In my opinion, coffee is overwhelmingly a mass-based equation (as opposed to time-based). If you’re within a reasonable range on time, but a precise range on weight, you’re going to have much more consistent results. 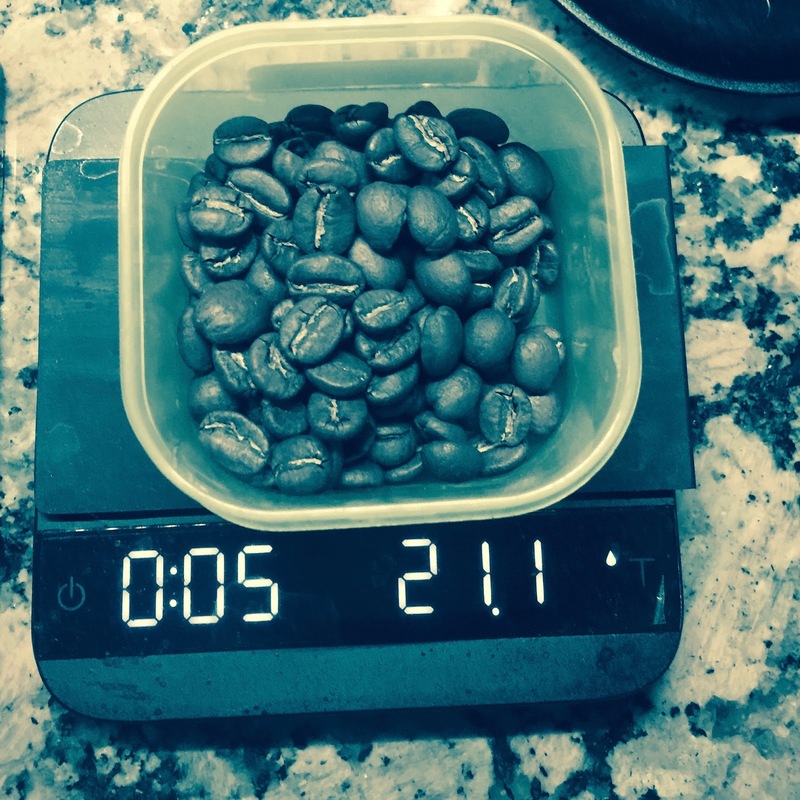 So I weigh the beans and then also weigh the shot. The scale that I have also has a built in clock that you can trigger to start when it detects the shot hitting the cup. My basket is a 20g basket. I also have an 18g, but I rarely use it. This gets into flow rate vs extraction. And also “headspace,” which is the gap between the top of the puck and the filter screen on the grouphead. You want to have enough space for the puck to expand a bit in there. So with the 20g basket, I will use between 20-23g (typically 20-21) of grind. So I weigh the beans first. Some folks with tell you, “ONLY change the grind to change the extraction time.” But that misses the point about flow rate vs extraction. More quantity of a coarser grind (say 22-23g) vs less quantity of a finer grind (say 17-19g) can give you the same extraction time but a different flavor profile. I like a more ristretto shot. So I typically shot for 30g of extraction from 20g of grind (ratio of 1.5). Jill likes it a bit more mild, so for her, I shoot for 40g from 20g. Both are very “normal.” The range of “normal” is basically 1.25-2. And you want to get that in somewhere between 20-30s. La Marzocco did an interesting blog post where time, “color” (what a lot of baristas swear by), and mass ratios were all compared. Mass ratios won every time. As long as you are within a reasonable range on time, mass ratio overwhelmingly determines flavor profile. Refractometers (you know what these are; when you do a drug test, it’s what they use to check the concentration of your urine) are basically the new “most valuable tool” in the coffee world. But you can get most of what you need just by using a scale. Grinder…do you like the doser option? I would not have chosen the doser. It’s just a LOT cheaper. It has some advantages, but overall, I would have preferred a grinder without. Just not enough to pay the extra couple hundred dollars. But if you’re asking if my “ideal” grinder has a doser, my answer is no. For you guys, if I was to looking to recommend a grinder, I’d probably steer you towards a Pharos. An automatic grinder is nice, but I also really enjoy the use of a hand grinder. As with getting a model with a doser, you just save a lot of money such that you can get a better grinder than you would if you tried to get something fancier. If you want an electric, the best buy for a doserless is probably the Compak K3 (you can usually find a 10% off coupon for a place that sells it). But the Pharos is basically 1/2 the price for arguably a better grinder. Likewise, the Ceado that I got was 2/3 the price for a probably better grinder because it was used and had a doser. The Acaia Lunar scale is also overwhelmingly worth it. Your tweet on flow rate and extraction. Can you adjust the flow rate on your machine? Or are you doing that with dose and grind? I can’t adjust pressure profile on my machine. The new Rocket V60 has that ability. And of course the pinnacle machine – the Slayer – has that option as well. But for me, I just do it with grind and dose. This seems to be the biggest difference with a good grinder. You can really make a lot more changes here than you can with a grinder that has small burrs and relatively limited adjustments.